We would like to introduce our Cadent iTero™ digital scannning machine - the world's only clinically-proven digital impression system. This revolutionary method of scanning the teeth and 3D digital imaging software is designed to replace the uncomfortable and imprecise method of conventional impression-taking. 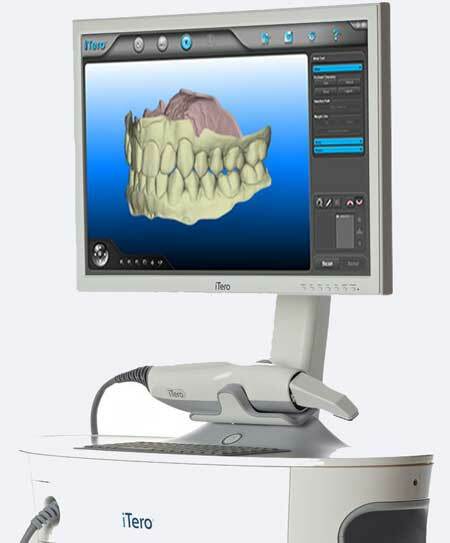 The Cadent iTero™ digital impression system is an exciting new technology that is light years ahead of cumbersome and expensive digital impression systems available today. iTero enables the dentist to take a digital scan of the patient's teeth and bite, make any necessary adjustments in real-time, and then transmit the file via a wireless Internet connection to a laboratory where the final restoration can be crafted with never-before-achieved precision and accuracy. For further information please visit the Cadent website.